No other gutter cover, gutter guard or gutter screen system works as effectively to keep debris from entering the gutter. Germicide and UV Protection Surface coating along with full coating. This provides UV protection andfire resistance. K-style gutters are the most popular gutter style with nearly 98% of homes using them. These kinds of statistics make it no big surprise that our 5 K-style gutter foam is the most popular size and style we make. 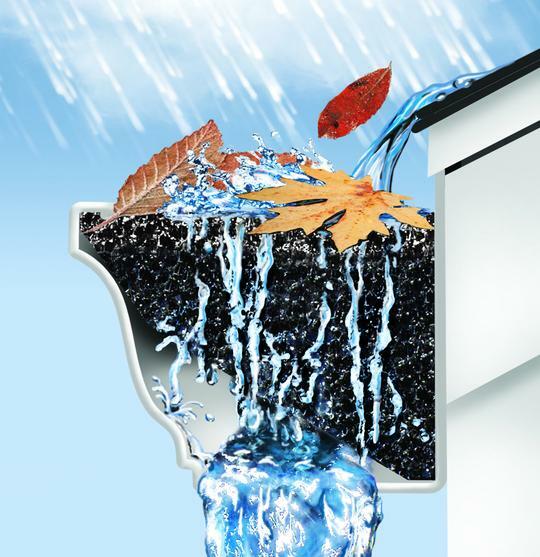 K-style gutters are designed with a flat back and bottom with a decorative front that may resemble crown molding or the letter K. K-style gutters can also be referred to as an ogee style gutter, but the design and ability to use GutterStuff as a protector against leaves, dirt and debris is the same. 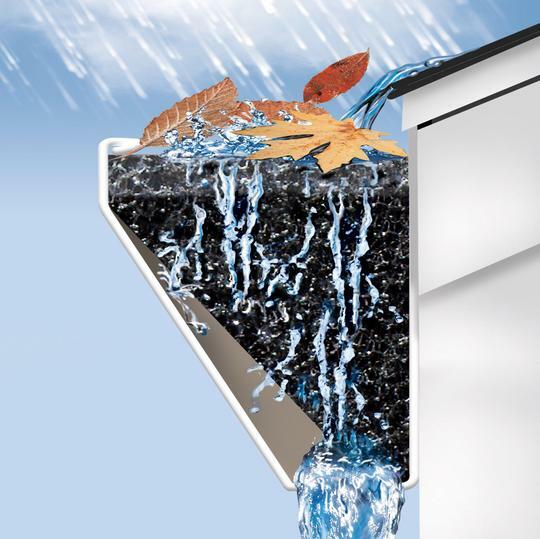 Designed to be durable and easy to use, GutterStuffs patented flat-bottom gutter foam holds its shape and protects your gutters from dirt and debris while still allowing water through. Prevents mosquitos from using your gutters as a personal breeding ground. GutterStuff is available in a variety of protective coatings to suit the needs of your home. Half-round gutters are the traditional gutter style for many, especially those with homes that were built before the advent of K-style gutters in the 1950s. Half-round, also known as U-shaped, gutters date back to the early 1900s and this traditional shape has lasted over one-hundred years due to its effectiveness. Like every gutter, half-round gutters can get clogged by the collection of dirt, leaves and debris so we created a GutterStuff foam to fit and protect half-round gutters. Half-round GutterStuff is designed to hold its shape and fit securely in the gutter without impeding water flow and a variety of coating options are available to suit you and your homes needs. 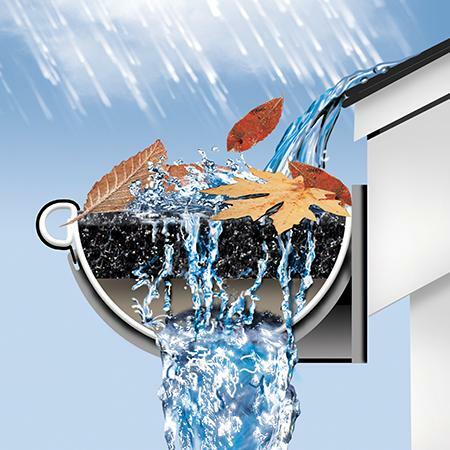 GutterStuff not only prevents gutter blockage, it also provides a layer of defense to prevent insects and animals from making a home out of your gutters. GutterStuff installation is fast, easy and can be completed without having to dismantle your current gutter system. Secured either to the timber fascia or can replace the timber fascia and be directly applied to the roof rafters. Provide more customization options for homes and often have a high-fronted finish that conceals the edging of your roof. Accommodate larger volumes of water than the more traditional K-Style and Half Round gutters. Fascia GutterStuff can be custom cut to fit, is easy to install and has a plethora of coating options to provide the ultimate gutter protection. Easy to install and generally only needs minor trimming to fit around support brackets.